CBDfx offers a wide range of products. Their roots are in vaping, but they’ve quickly branched out to create other high-quality CBD products, like gummies, capsules, and tinctures. 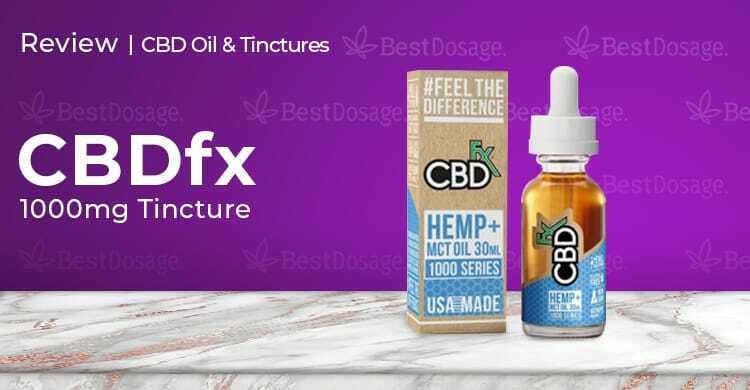 CBDfx has been around since 2015 and is known for being a brand that is serious about their products’ quality as well as their customer service. This product works well as advertised and, although it is a bit more expensive than some others, it is well worth it. You get peace of mind with the brand, and you get peace of body from the effects of the CBDfx CBD tincture. This bottle of CBDfx CBD tincture is 100% organic and is beautiful in its simplicity. It’s made up of only two ingredients: hemp oil, and MCT oil derived from coconuts. That means it is a full spectrum CBD solution that has no fillers. MCT oil is there to act as a carrier and is an effective one at that. This product is also gluten free, non-GMO, and 100% vegan. The bottle is 30ml and comes in this 1000mg variant, a lower strength 500mg option, and a higher strength bottle containing 1500mg of CBD. Usually, the first thing we notice about any product is its packaging. It can say a great deal about the time and effort the company invests in its product line. With the CBDfx CBD tincture, it was the areas around the packaging that stood out. What we mean by this is that the label around the box didn’t obstruct our view of the CBD oil tincture. We could see through the clear bottle and instantly gauge color and purity. This is absolutely not typical and for us, it showed how transparent CBDfx is. The color of the tincture, by the way, was perfect. A light gold that indicates the quality of the filtering. We still loved the packaging too, as we always do from CBDfx. Everything the information is printed in plain sight. We quickly found all the ingredients and directions on the bottle. It also comes with a very sturdy dropper that had the right sensitivity. This is important since tinctures can be dosed up or down in as little as single drop increments. The taste was actually very natural and it didn’t leave much of an aftertaste, which was a pleasant surprise. The manufacturer recommended dosage for the CBDfx CBD tincture 1000mg version is 1 full dropper, which would mean 33.3mg of CBD. Our personal experience is that, if you’re new to CBD, don’t start with a full dropper. Take half at most and wait up to an hour to feel the effect. If it isn’t strong enough, up your dosage gradually over the period of a few days. Expect to take more for pain than you would for anxiety or insomnia. While the effect can vary from person to person, just about everyone on our review team felt some level of success with it. It did wonders for insomnia, probably better than any of the other tinctures we’d tried. For anxiety, there was a subtle but clear relaxation that set in about an hour after dosing. One member of our team had pain in their toes and that took some time to understand the dosage needed, but it helped them in the end as well. Lastly, one of our female team members took it for cramps and simply raved about the results. Effects seem to last somewhere between 4 and 6 hours. There are only two ingredients in this tincture: High-quality CBD and MCT Oil derived from Coconuts. CBDfx does a great job with customer support, giving you a variety of contact options. They are very quick to answer their toll-free number, but you can also do things electronically by shooting them an email or engage in live chat on their site. Reps were friendly and helpful in all modes of communication and responses were swift. They even do a great job answering you on Instagram if you prefer that medium. Free shipping on all orders in the USA – can’t beat that! CBDfx also offers very accurate tracking and have been known to delivery packages early. CBDfx CBD tincture has quickly become one of the standards we judge other tinctures on. It’s clearly high quality and it has a great brand name behind it and the support that comes along with it. The tincture itself tasted smooth and natural, which is a big step up from the many awful tasting tinctures we have tried in the past. This product works well as advertised and, although it is a bit more expensive than some others, it is well worth it. You get peace of mind with the brand, and you get peace of body from the effects of the CBDfx CBD tincture. Both are important and that’s what makes us continue to stock it in our medicine cabinet, always within reach.